The Little Parklet That Could! Buy a $15 voucher to Mercury Cafe and they’ll devote the proceeds to raise funds to complete a highly anticipated parklet right outside the cafe! Buy now and redeem any time you like. Carrotmobbers! We asked you for campaign ideas! We asked you to help us organize campaigns! Kristen Berman, a local organizer here in San Francisco was the first of many to answer the call and she came to us with a great campaign! Carrotmob and Mercury Cafe are partnering to raise funds to build a parklet. For the past two years, Mercury has been raising funds to complete a parklet right outside the entrance to the cafe on Octavia Street. And is this going to be a great parklet. A public space for people to sit, read, talk, and, yes, drink coffee, the parklet will be made from reclaimed wood and feature innovative green features to make the space incredibly cozy. It will be an incredible public space for the community to gather and increase the quality of life in Hayes Valley, one of San Francisco's most treasured neighborhoods. Problem is, they have only raised $6,000 of the anticipated $8,000 cost. They need US (yes, you Carrotmobbers!) to get them over the finish line! After talking with us, they have agreed to devote 15% of every dollar spent in the Carrotmob to bridging the gap and turning this from vision into reality! You can buy as many vouchers as you like. Your vouchers will never expire. You can spend them on any of Mercury Cafe’s offerings. You will get a voucher which you can either print out and bring to Mercury Cafe or you can present your voucher right from your mobile phone’s web browser. You need to use the entire $15 value in one visit. The voucher does not cover gratuity. Carrotmobbers! We asked you for campaign ideas! We asked you to help us organize campaigns! Kristen Berman, a local organizer here in San Francisco was the first of many to answer the call and she came to us with a great campaign! 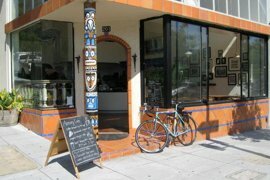 Mercury Cafe is a famed local haunt and one of Hayes Valley's best coffee shops. But today, Nick Parker, Mercury Cafe's owner is at a crossroads. For the past two years, Nick has been raising funds to complete a parklet right outside the entrance to the cafe on Octavia Street. And what a great parklet this will be! A public space for people to sit, read, talk, and, yes, drink coffee, the parklet will be made from reclaimed wood and feature innovative green features to make the space very cozy and community oriented. Problem is Nick has only raised $6,000 of the anticipated $8,000 cost. He needs US (yes, you Carrotmobbers!) to get him over the finish line! After talking with us, Nick has agreed to devote all the proceeds from the Carrotmob to bridging the gap and turning this from vision into reality! Mercury Cafe features a delectable selection of fair trade coffee, tea, and pastries. Mercury also features a variety of sandwiches including avocado, caprese, and mortadella as well as soups and breakfast sandwiches. More menu information is available here. San Franciscans love Mercury Cafe as evidenced by these Yelp reviewers, which rate both the food and the atmosphere very high. Open Mon-Fri 7:00AM – 8:00PM, Sat-Sun 8:00AM - 8:00PM, Phone: (415) 252-7855. Learn more. Street parking nearby or you can bike =). Is Mercury Cafe any good? Yes, they are very highly rated on Yelp. Simply present the voucher on paper or on your phone to your server to pay.